The Nelson Ball Pendant Lamps are a collection of three mid-century spherical lighting fixtures made by stretching a translucent plastic film over an internal steel wire skeleton. Inspired by silk and paper hanging lamps, George Nelson created the Nelson Pendant Lamps in 1952 as a diverse collection of shapes and sizes that could be used individually or grouped together for a myriad of uses and environments. Nelson Ball Pendant Lamps comes in three specific sizes from small to large. The small pendant has a width of 12.75” | 32 cm and height of 12” | 30.5 cm. The medium pendant has a width of 19” | 48 cm and height of 15.5” | 39 cm. The large pendant has a width of 26.75” | 68 cm and height of 23.5” | 60 cm. The Nelson Ball Pendant Lamps have a cord length of 6’ | 1.83 m.
What is the Nelson Ball Pendant Lamp? The Nelson Ball Pendant Lamps are a trio of mid-century spherical lighting fixtures designed by George Nelson (1952) made by stretching a translucent plastic film over an internal steel wire skeleton. 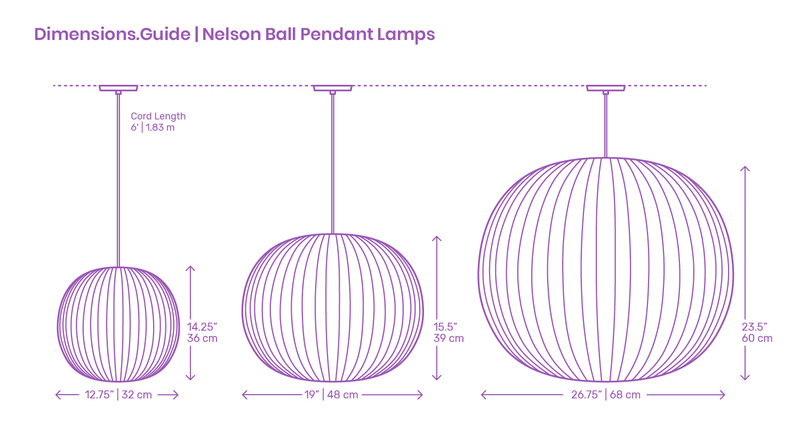 How big is a Nelson Ball Pendant Lamp? Nelson Ball Pendant Lamps comes in three distinct sizes. The small pendant has a diameter of 12.75” | 32 cm and height of 12” | 30.5 cm. The medium pendant has a diameter of 19” | 48 cm and height of 15.5” | 39 cm. The large pendant has a diameter of 26.75” | 68 cm and height of 23.5” | 60 cm. How high should Nelson Ball Pendant Lamp be hung? Though the collection contains a variety of pendant sizes, the bottom of each Nelson Ball Pendant Lamp should be hung 28”-36” | 71-91 cm above a countertop surface or 30”-36” | 76-91 cm above a dining table.